NOIRE, a leading London-based online payments service provider, are pleased to announce the introduction of additional cross border processing for Chinese payments. This follows on from a similar expansion of services last year to improve the efficiency and security of online payments made from the South America region, including major economic centres such as Brazil and Mexico. NOIRE's latest alternative payments venture is designed to address some common issues, which are currently preventing many growing e-commerce businesses across the UK and Europe from fully succeeding in Asian markets. By incorporating China UnionPay, Alipay, QQpay, WeChat, Baidu, Jingdong and Payouts into their dedicated all-in-one platform, NOIRE are leading the way in simplifying cross border Chinese payments. The ultimate aim, according to NOIRE CEO Tim Thompson, is to offer retailers, FOREX and other online merchants a 'complete solution', transforming currency-related deterrents into a thing of the past. However, it is not just businesses who are expected to benefit from better alternative payment options from China. NOIRE's expansion of services to the East Asian region is also likely to resonate with Chinese consumers who want to see greater purchasing options introduced. NOIRE's cross border payment processing will result in an easier and safer way for Chinese residents to shop internationally. NOIRE's expansion of Chinese payment options comes at a time when cross border purchasing is increasing at an almost unprecedented rate. It is reported that 40% of online shoppers make overseas purchases, with China expected to surpass today's dominant e-commerce markets, such as the United States, in the near future. However, it appears that technology is struggling to keep up with the evolution of the average consumer, with many existing online purchasing and payment solutions failing to offer suitable options that make shopping safe and simple for international buyers. A report by online marketing insight agency Biz Report suggests that a lack of payment options is currently one of the biggest obstacles preventing e-commerce businesses from expanding into new markets. It is claimed that between 28% and 32% of shoppers will abandon their online carts if they discover that their preferred payment option is not available; an issue affecting young shoppers most. The Financial Times confirms that, unlike the situation in Europe, cash still dominates across many parts of Asia. In fact, it is estimated that just 2 percent of people in South East Asia use credit cards, and those that do aren't likely to choose a bank renowned for international processing such as Visa or Mastercard. Instead, the market share goes to China Union Pay, which holds just a 0.5% share of the global market. NOIRE recognises that it is imperative that Chinese shoppers are provided with options that are not only familiar, but which are also favoured by the shopper, to improve satisfaction and brand loyalty. 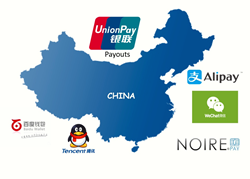 NOIRE have therefore introduced China UnionPay options, as well as alternative payments including the hugely popular AliPay, QQPay, WeChat Pay, Baidu and Jingdong. Boasting real time transaction monitoring and proxy detection, recognition technology and advanced reporting, cross border processing services are designed to protect both merchant and consumer, minimising the risk of chargebacks, increasing conversion rates, and ultimately boosting sales through a comprehensive international payment processing service that's quick, simple, and secure. In a similar fashion to their South American venture, NOIRE are continuing to provide e-commerce businesses with access to some of the world's most promising emerging markets. All-in-one payment solutions will boost the efficiency, reach, and overall security of Chinese payments to international businesses. By combining simple cross border processing with unrivalled fraud detection and risk management, NOIRE are demonstrating that they are clearly leading the way in alternative payments providing a complete global solution for its customers. The addition of Chinese payment options, including China UnionPay Payout and Alipay, brings the total number of alternative payment options offered by NOIRE to more than 250. This number includes common international payment methods like Visa, Mastercard, American Express, Skrill, Paysafecard, Sofort and Paypal, as well as more localised payment options such as Brazil's Banco Itaú, Hipercard, and other South American local payment schemes including Boleto. The latest expansion of services, combined with last year's South American venture, indicates that NOIRE are committed to providing international payment solutions for more and more global markets. It is anticipated that NOIRE will continue to lead the way into the future. About NOIRE: NOIRE is a leading UK-based boutique payment and fraud risk solution provider. The company offers internet merchant accounts, alternative payment methods and payment gateway technology, along with pioneering the most advanced risk management and fraud protection technology for companies ranging from large FTSE listed companies to new fast-growing merchants.